A school bus is usually the last thing kids want to see during the summer. However, they seem willing to make an exception for this one: a short, bright blue Chevy G30 stuffed with buckets, audio cables, drumsticks, and a mobile recording studio dubbed the Beat Bus. A new collaboration between two nonprofits, The Record Company and Kadence Arts, the Beat Bus has made appearances at dozens of camps and youth centers around Boston this summer. 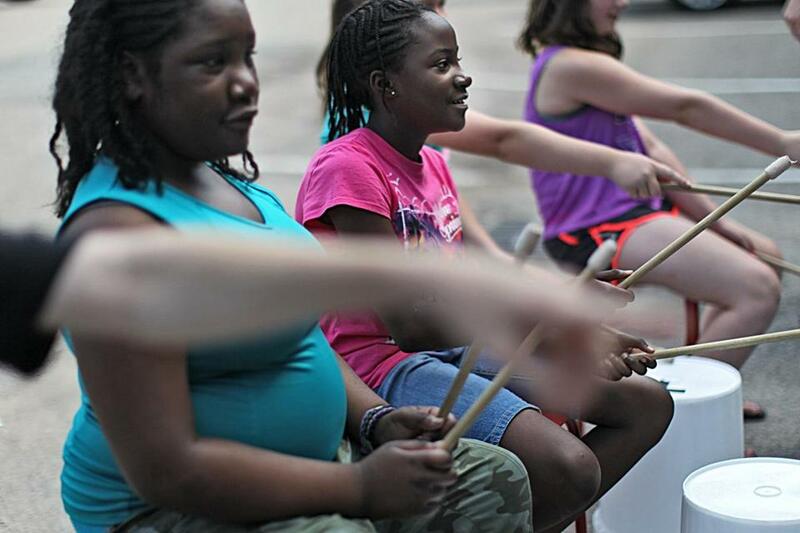 Drummer Maria Finkelmeier uses it as a base to give kids frenetic half-hour lessons on the basics of rhythm, harmony, and melody, everyone banging on overturned plastic buckets wired to electronically trigger a variety of instrument sounds. The Beat Bus audio system is simple, but ingenious. Each time a kid hits one of the buckets, a cheap piezoelectric sensor screwed into its rim detects the vibration and triggers software on the computer in the bus to instantaneously play back a pre-recorded audio sample through a pair of speakers. Brianna Charles, 9, in pink, and Kaisha Toombs-Porcher, in blue, played the drums. The sound each bucket makes can be reprogrammed on the fly — hand claps one moment, fuzzy synthesizer chords the next. And the instruments can be locked into a particular key or tempo, allowing amateurs to improvise alongside pros without sounding a bad note. Audio engineers might shrug at the rig, which is assembled from common off-the-shelf parts. But to the kids, it’s pure magic: When Finkelmeier signals her assistant to activate the computer, and the buckets suddenly switch from producing a hollow unamplified bonk to a booming, dance-club kick drum hit, a group of 5-year-old campers involuntarily gasp and cover their mouths, turning to each other in happy disbelief. 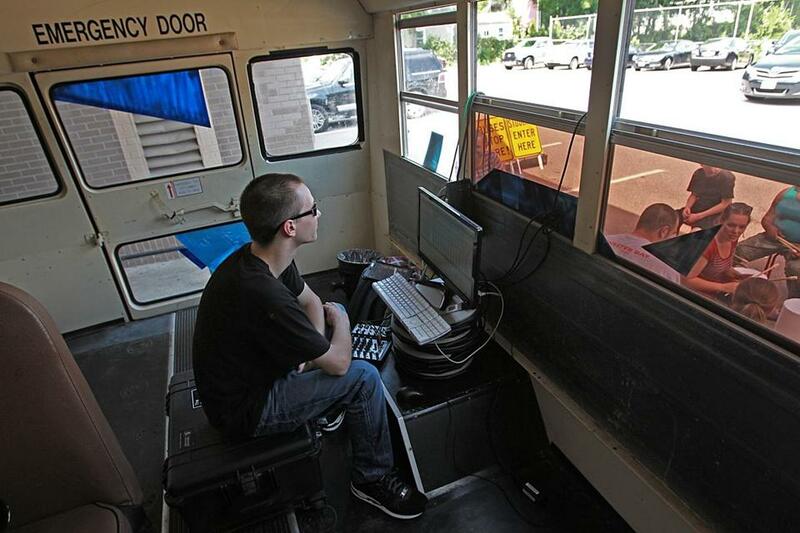 Bryce Quinn, of The Record Company, inside the bus, monitored the audio. Part of the Beat Bus mission is to get more kids interested in music earlier in life, bolstering the pipeline of up-and-coming players. But not everyone is destined to be a musician, and that’s OK, Finkelmeier and McArthur say. The real idea is to get youths thinking critically about both music and technology. “Some of them are really into the music-making, some are really into — ‘wait, why are there wires coming out of the buckets?’ ” Finkelmeier said. “Maybe by wondering how that trigger worked, they’ll get really into taking things apart and become an engineer.